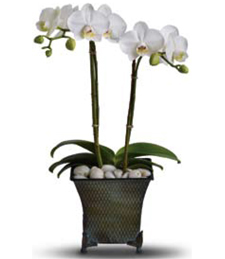 Two twin orchids arrive side by side in the most perfect tropical arrangement full of purity and relaxation. Send that special someone something that will put them into a deep trance of pure relaxation and peace. The utlimate gift for a token of you sincerity. Some tropical flowers may vary by region.